Got your surf skills down pat and just want to pick up a board for a surf and save yourself the hassles of carting your own to the coast. We have got you covered with an assortment of Mals, Mini Mals, short boards, hardboard & softboards. Got your surf skills down pat and just want to pick up a SUP board for a paddle and save the hassles of carting your own to the coast. 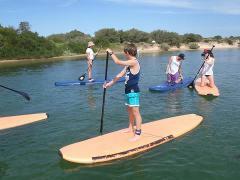 We have got you covered with an assortment of hard & soft Stand Up Paddle boards.